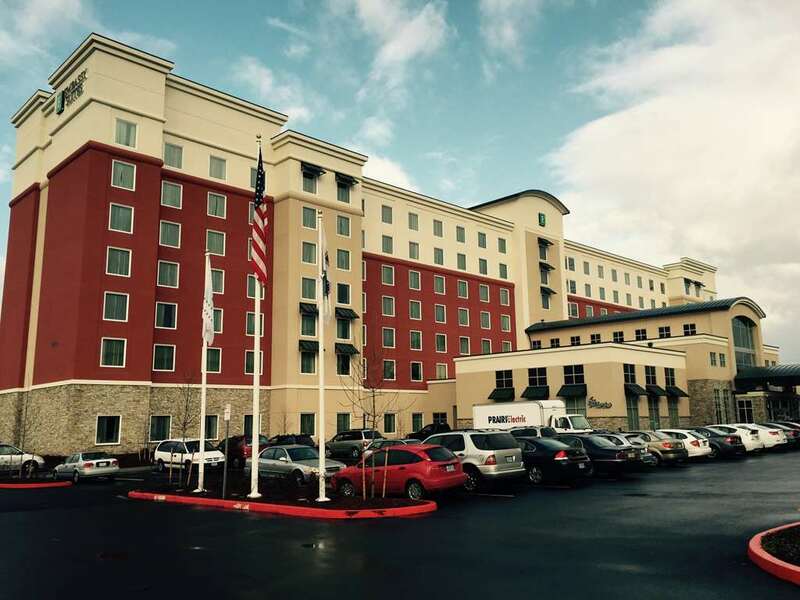 The first full service hotel in Hillsboro OR Embassy Suites Portland/Hillsboro Oregon is moments from the Streets of Tanasbourne shopping mall and just a few blocks west of a highway interchange. Situated in the Silicon Forest our all-suite Hillsboro Oregon hotel is only minutes from Hillsboro Airport and several Intel campuses and offers easy access to major businesses corporate HQs and high-tech manufacturing companies. Just a mile away the MAX Light Rail line provides fantastic connectivity to Beaverton and downtown Portland. Visit nearby attractions including the Gordon Faber-Hillsboro Stadium the Tualatin Hill Parks - Recreation District and Pumpkin Ridge Golf Club all within easy reach of our hotel in Hillsboro Oregon. Wake up to a complimentary cooked-to-order breakfast in our welcoming restaurant. Work out in the modern fitness center or swim in the indoor pool. Unwind over complimentary beverages* and appetizers at our nightly Evening Reception held in the hotel*s inviting atrium. With a complimentary 24-hour Embassy BusinessLink Business Center and over 3 200 sq.ft. of flexible event space our stylish hotel in Hillsboro OR is ideal for business meetings and celebrations for up to 300 people. Settle into a modern two-room suite. designed with flexible furnishings that allow you to create your own space. Check emails with WiFi at the ergonomic desk or watch movies on one of two 40-inch HDTVs. Our comfortable suites also offer a microwave and refrigerator to make you feel at home. *Subject to state and local laws. Must be of legal drinking age.